This week I'm working hard on lots of Maiedae work, including some fun new client designs! We are also taking Soren in for his 2 month appointment on Wednesday. I can't wait to hear about how much he's grown! 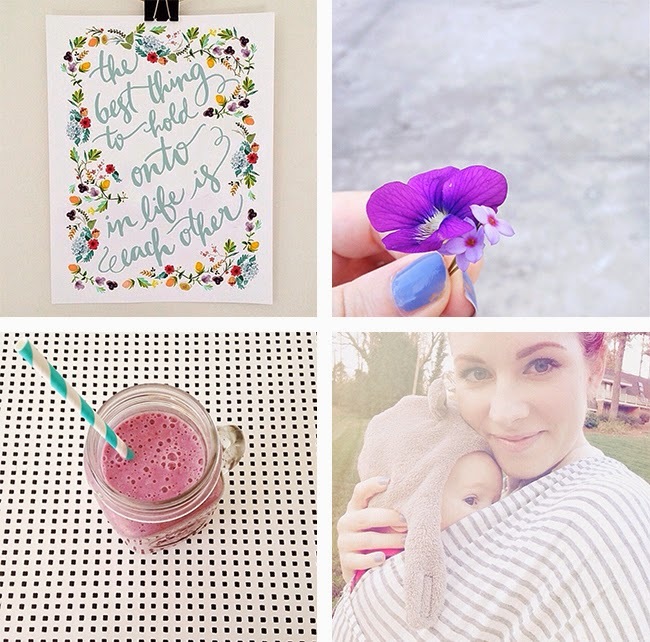 Snapshots of the Week: 1// I love Jenny's beautiful work. Especially this new print. :) 2// I love all of the little blooms in our neighborhood. 3// Been enjoying smoothies a lot lately! 4// Soren and I during out walk the other day. * Just reached over 5k followers on my YouTube channel! Thank you so much!!! * Speaking of YouTube, I can't get enough of Ingrid's apartment tour. * Oh! I really want to make this homemade Oatmeal Almond soap! * I prefer homemade cookies over store bought. * I do my best graphic design work during the middle of the day. * I LOVE the feeling I get after finishing a home-improvement project.